If you’re a coin collector in the state of Arizona, you should come into our Mesa antique coin store to browse through the huge array of rare coins we have in our inventory. Many of these have tremendous value in the world of coin collecting, especially to other numismatic enthusiasts who are aware of their value. We have acquired many gold and silver pieces, as well as copper and nickel, and the best-preserved coins are as beautiful as they are valuable. We have many of the most sought-after coins in the business, including Morgan silver dollars, Peace Dollars, Silver Eagles, Walking Liberty Half-dollars, as well as some of the very first coins minted in this country. All are preserved in the same pristine state in which we acquired them originally, so we can now offer them to you in their very best condition. The real benefit to you as a buyer is that you can purchase these very valuable coins at discount prices, much cheaper than you would expect to find at any coin dealer or private numismatist. Although coin dealing is only one of the commodities which we deal with here at our pawn shop, we do have an expert on-hand to explain the value of any piece we have in-house, and make it available to you at the most reasonable price. Because of the low, low prices which we can offer you, there is no reason for you to go anywhere else in the area when you’re shopping for high-quality antique coins – come to us first and find out why there’s simply no better antique coin store in the area. If you happen to be short of cash, and you need to liquidate all or part of your own collection, bring it to us and have our experts assess your coins. We can offer you the best price of any shop in the area, and we’ll be glad to give you a rundown on exactly what everything is worth, as well as why it’s worth that much. We have had many coin collectors come to us, and each has gotten the best possible pricing for any coins we purchased from them. Our business depends on customer satisfaction, so we go out of our way to ensure that every client who comes to us gets the fairest treatment and the best deal for what he or she is selling. 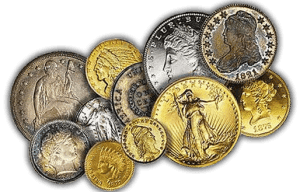 Whether you are buying or selling, we are the antique coin store in Mesa, Arizona that you should come to for all your coin needs. Let us show you why we are consistently rated the #1 pawn shop in Mesa, Arizona and why our customers keep coming back to us to sell items of value for cash.